Featuring a built-in AMD A10-4655M quad-core processor capable of Turbo clocks of 2.8GHz with a base clock of 2GHz, the motherboard delivers modern-day multitasking performance for day-to-day task as well as decoding task for entertainment use, enough to play HD content. The motherboard supports DDR3-1333MHz memory up to 32GB for excellent compatibility and all comes in the compact mini-ITX form factor perfect for SFF. The BIOSTAR A68N-5600 features tried-and-tested BIOSTAR technology in delivering excellent experience for users including HD Audio for excellent sound replication and listening perfect for watching movies with full support for DirectX11.1 for greater support for 3D applications. 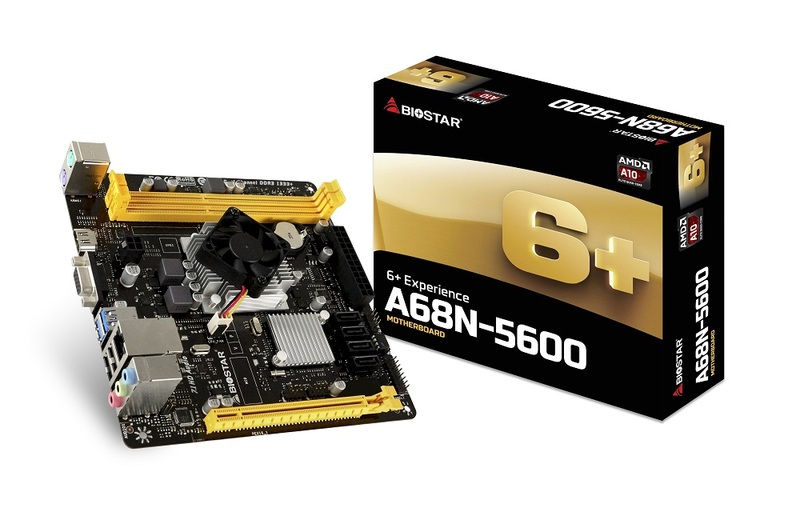 The BIOSTAR A68N-5600 features legacy PS/2 connectors as well as a pair of USB3.0 and USB2.0 ports for connectivity. A full 1Gbps LAN port is present for high-speed transfer. Multimedia I/O includes video output for both HDMI and VGA both supporting up to 1920x1200 @60hz output. Multi-channel audio is available up to 7.1 channels and pure high definition audio. The BIOSTAR A68N-5600 has an MSRP of USD64.99.